Teachers and staff can’t say enough about the new Liebman Science Center at McHenry County College. 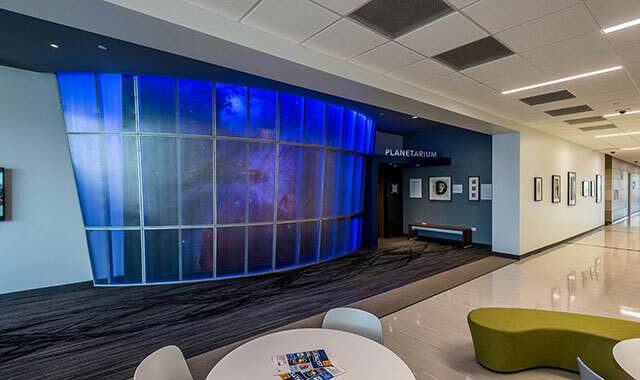 Step inside this hub for science education and learn about its many modernized features. 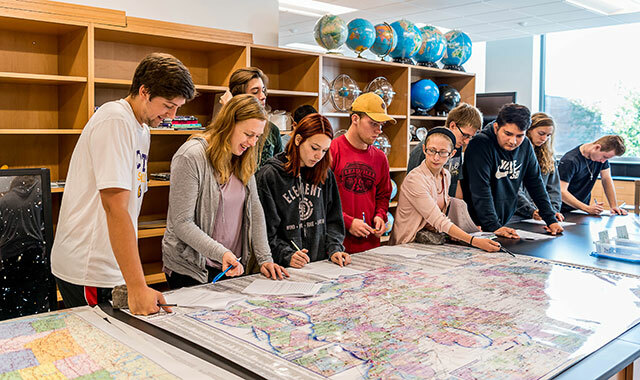 Students in Ted Erski’s energy resources lab inside the new Liebman Science Center at McHenry County College examine a map illustrating electricity providers and high-voltage transmission lines within the United States. The science center opened its doors to students this past fall. Students at McHenry County College (MCC) in Crystal Lake now have access to a state-of-the-art facility that’s serving as a modernized hub for science education. Liebman Science Center, the college’s new 40,800-square-foot, two-story building, is designed to give students the advanced knowledge and skills needed to be successful in job fields involving science, technology, engineering and mathematics. The classroom and lab expansion, which is connected to the existing campus, hosted its first classes this past fall. Construction started in spring 2017, after years of discussions among the MCC Board of Trustees about giving the college’s science facilities a major upgrade. Among the 22,000 square feet of classroom and lab space are a cadaver lab, two lecture halls and a planetarium. College president Clint Gabbard believes the new center provides an important advantage to McHenry County residents. The Liebman Science Center has giant, oversized windows that let in natural sunlight. There are also several open meeting spaces where students can charge their devices, conference as they complete their coursework or meet with teachers. The science center boasts large, oversized windows that let in natural sunlight. There are also several collaboration spaces where students can charge their devices, conference as they complete their coursework or meet with teachers. The first floor holds biology labs and prep space, anatomy and physiology labs, a cadaver lab, lecture hall, a student resource room and various student collaboration spaces. Head up to the second floor and you’ll find chemistry labs, a physics lab, earth science labs, a planetarium, a weather center and additional collaboration spaces. The planetarium features a digital projection system that displays an arrangement of stars and planets on an 8.3-meter dome, along with theater-style seating for 45 people. MCC is one of only four community colleges in the state that boasts this kind of technology, Haggerty says. A unique highlight of the building is the planetarium’s window, which lights up at night on the north side of the building. It displays one of the first images captured by the Hubble telescope: the Tarantula Nebula, one of the largest documented star-forming regions in our galaxy. The $17 million science center is paid for with a combination of private donations, college funds and student fees. A $5 million donation from local resident and longtime college supporter Charles Liebman and his family started the fundraising campaign, which is nearing its $7 million fundraising goal. For his generosity, the building bears the family’s name. In keeping with its emphasis on science and technology, MCC’s newest building is a showcase of eco-friendly features. Innovative designs help to measure water efficiency, indoor air quality and energy savings with overall lower maintenance costs than traditional buildings. Plumbing features promise to use as much as 30 percent less water than standard fixtures. Other sustainable features include an electric vehicle charging station, a bicycle rack, dedicated parking spaces for low-emitting vehicles and all-LED lighting both indoors and out. Native species of trees, shrubs and plants surround the building and an outdoor classroom featuring a crushed granite teaching pad and a compass rose sundial. “We have built in some outdoor learning spaces to show students that learning happens everywhere, not just in a classroom,” Gabbard says. Among the 22,000 square feet of classroom and lab space are a cadaver lab, two lecture halls and a planetarium. Right outside the Liebman Science Center is a GeoScene wall (top), which allows students to investigate various geologic patterns. 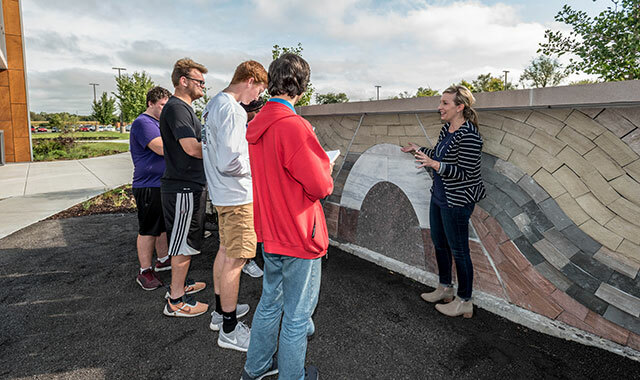 The science center also comes equipped with a GeoScene wall, a colorful geological structure near the main entrance that students can use while investigating various geologic patterns. Measuring more than 5 feet tall and 16 feet wide, it’s the largest of its type in the country, Haggerty says, and it represents all three rock types: igneous, sedimentary and metamorphic. Cornfields surround the campus and the area has no rock outcrops with geological structures. That’s why Kate Kramer, earth science and geology instructor, is excited to integrate this wall into her lesson plans. Haggerty says the college has received plenty of positive feedback about the science center. As a way to provide additional learning opportunities, MCC has started hosting a new speaker series, which features topics including astronomy, digital technology, food science, paleontology, and meteorology and weather broadcasting. Lindsey Slater, a meteorologist and broadcaster with WISN 12 NEWS in Milwaukee, hosts a lecture on March 15 at 10 a.m.
Jolie Matthews, assistant professor of learning science at Northwestern University, discusses digital technology, social media and learning on April 19, and Katherine Darnstadt, founder of Latent Design in Chicago, discusses architecture and design in the environment on May 3. Each lecture in the series is free and open to the public. This entry was posted on Tuesday, January 29th, 2019 at 12:00 pm	and is filed under Mind & Spirit, Top Posts. You can follow any responses to this entry through the RSS 2.0 feed. Both comments and pings are currently closed.